This month, UConn composer Kenneth Fuchs released the fifth album of his original compositions recorded by the London Symphony Orchestra, “Spiritualist – Concerto for Piano and Orchestra,” a major release for the fall from Naxos, the world’s leading classical music label. The recording is already charting internationally, at No. 5 in pre-sales on the Amazon Best Sellers list for classical music. The title track is performed by pianist Jeffrey Biegel. The disc also includes “Rush,” a concerto for alto saxophone and orchestra performed by Timothy McAllister; “Poems of Life,” a work based on the poems of Judith G. Wolf, sung by countertenor Aryeh Nussbaum Cohen; and “Glacier,” a concerto for electric guitar and orchestra, performed by D.J. Sparr. 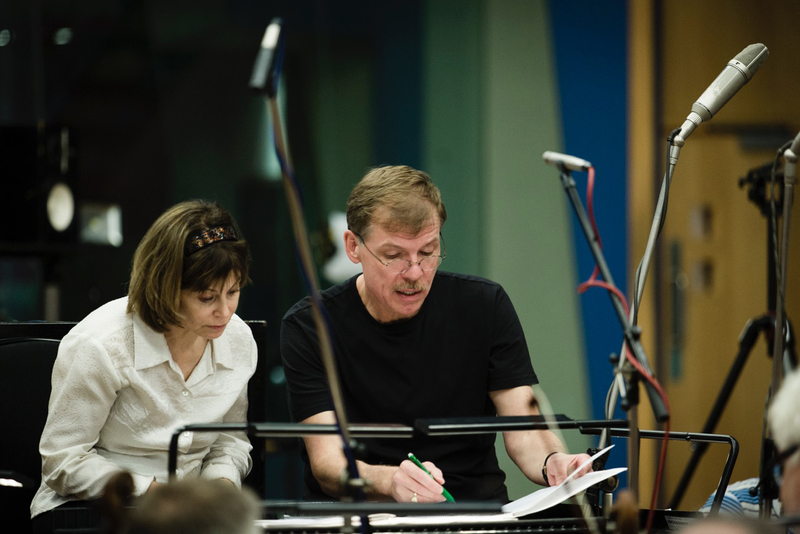 Kenneth Fuchs confers with conductor JoAnn Falletta during a recording session with the London Symphony Orchestra in the Abbey Road Studios. The recording was made at Abbey Road Studios in London, which opened in 1931. While the studio is probably best known for albums made by The Beatles, it also is where many of the 20th century’s most celebrated musicians recorded, including pianist Vladimir Horowitz, cellist Pablo Casals, band leader Glenn Miller, and singer Tony Bennett. Fuchs collaborated with his longtime friend, renowned conductor JoAnn Falletta, who led the London Symphony Orchestra for the fifth time performing his compositions. Funding for Piano Concerto ‘Spiritualist’ was provided in part by the Offices of Global Affairs, Vice President for Research and Dean’s Office of the School of Fine Arts at UConn.